Cunning questions ranging from spontaneous combustion to Postman Pat. The Picture Round is name the Famous Directors from the movie artwork and the Wild Card is a poser on a pole vaulting Ukranian! Q10. In what Dickens novel does Krook, the brother of Mrs Smallweed controversially meet his demise by spontaneously combusting? Q17. Runaway Boys and Rock This Town were both top ten hits for which early eighties (rockabilly) band? Q29. Why did Eagles fan Matthew Simmons get his fifteen minutes of fame in 1995? Q33. Which village does Postman Pat deliver the mail to? Here’s a low-res sample of the Famous Directors Picture Round, click for a higher resolution version. The Picture Round download is a two page high quality PDF with the answers on page 2. 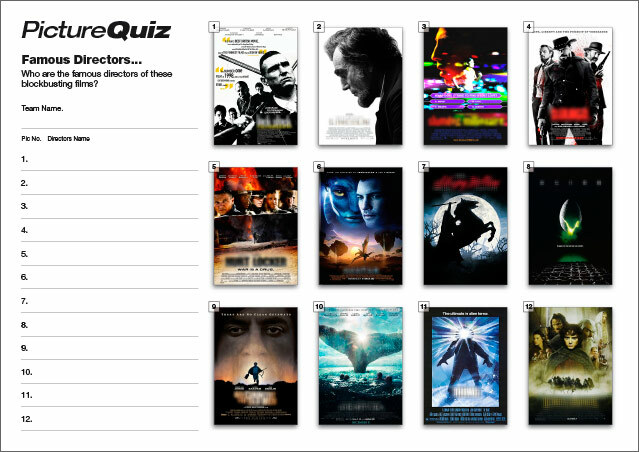 Quiz 39s Picture Round is name the Famous Directors from the movie artwork shown. The Wild Card for Quiz 039 is a poser on a pole vaulting Ukranian’s increase in height.